To setup 'Bike to Work' in BrightPay you create a tax allowable deduction. To do this go to Employer > Deduction Types > New > Enter a description in the name field e.g. Bike to Work > tick to deduct before PAYE tax, employee PRSI, employer PRSI and USC. A default amount can be entered if you wish, alternatively, it can be left at zero and the amount entered for the relevant employees when applicable. Select 'repeat until manually removed' for the 'default repetition'. To apply the deduction to an employee's payslips go to Payroll > Select Employee > Click 'Add' under 'Additions and Deductions' > Select 'Bike to Work' > enter the value of the deduction for the relevant employee. For example, if the total cost of the bicycle and equipment is €780 and the repayment period is 26 weeks the weekly deduction amount will be €26. 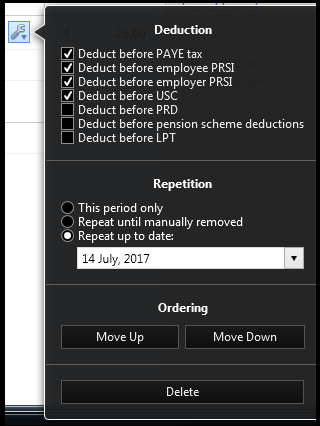 To enter the date the deduction should be applied until click on the spanner/edit utility beside the deduction and select 'Repeat up to date:' > enter/select the end date. If 'Repeat until manually removed' is selected it will be up to the payroll user to stop/remove the deduction from the employee's payslip once the total cost of the bicycle and equipment has been recouped. When the payroll is processed, the amount entered above will be deducted from the employees wage before PAYE, PRSI and USC are calculated. Please note, under the scheme there is no PAYE, USC or PRSI due on the cost of the bicycle and/or accessories up to the limit of €1,000. The maximum term for the repayment of the bicycle and equipment is 12 months.